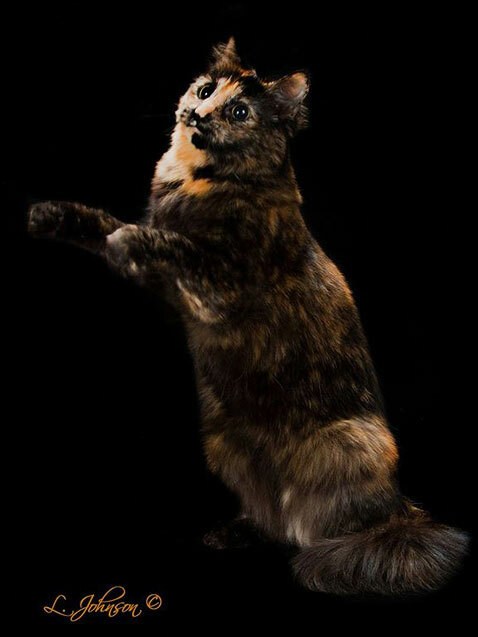 On May 9 at 10:38 AM EST, a longhaired tortoiseshell spay named Blaise became the first cat to earn the new CFA title of Grand Household Pet (GH). Blaise is owned and loved by Sue Robbins and Warren Cummings of Madison, Virginia. This is the story of retired Tonkinese breeders who rescue three kittens that were abandoned and starving in a woods. It is the story of how one of those kittens grows up to make history in CFA . . . In July of 2013, our next-door neighbor's grandson, Don, and his girlfriend, Kelly, came knocking on our door. Kelly explained that she had found two kittens in the woods, but could not keep them due to pet limits at the house her parents rented. My neighbor, Brenda Baird, could not keep them, either. They knew we were cat-lovers, so they were wondering if perhaps we could help? Warren, my husband, and I looked at each other with the silent communication that long-married couples develop. "Of course we will take them." Kelly had left the two kittens at a friend's house. She mentioned that there was a still a third kitten in the forest that they were unable to catch. We suggested they bring the first two babies to us and once they were settled in we would drive to the woods ourselves and try to capture the last kitten. Kelly and her beau left to retrieve the two kittens. Meanwhile, Warren set up an isolation area in our basement, including a cage where we could put the babies and they would be safe. An hour later, the kids returned carrying a cardboard carton. We opened the flaps and there were two teeny kittens huddled together with their big eyes staring up at us. Both kits were tortoiseshells, one fluffier than the other. Warren settled them in the cage in the basement with food and water. They devoured the goodies and curled up together for a contented nap. With the first two babies fed and sleeping, Warren and I set off to Brightwood with our trap and some tasty cat food to see if we could lure the missing sibling. We discover the third kitten, yet another shorthair tortie, so hungry that she was eating leaves and twigs. Although inquisitive, she was not quite yet ready to trust us, so rather than trying to chase her, we baited the trap and left her alone. Returning a half an hour later we found her in the trap. Mission accomplished! We brought her home and reunited her with her sisters. The bedraggled babies were sorely in need of food, water and care. We realized they would probably not have survived in the woods more than another day or two. The kittens were fairly well socialized though, certainly not feral, so we suspected that they had been raised around people. My husband and I were equally disgusted to think the three kittens had been deliberately discarded in the woods with no chance of survival. Personally, I think there's a special place in hell for people like that. Warren's thoughts on the subject are unprintable. Warren played with the kittens for a bit every day, and I was always downstairs with them because they were absolutely irresistible. After a couple of weeks, we contacted our local Madison-Green Rescue Association and made plans to take the girls in when they were older to have them spayed—while at the same time volunteering to continue to foster them until they could be adopted into permanent homes. Because of their distinctive markings, we named the two shorthairs Pansy and Arlecchina, and the longhair became Blaise—with a fancy spelling because she was a fancy cat. I never suspected just how "fancy" Blaise would become! After the kittens were spayed, we waited until they were a little older, then Warren took all three to their first Adopt-a-Thon in Charlottesville. Arlie, the least affectionate of the three, was adopted almost immediately by a worker at the Petco, who had a puppy named Arlo. But no one wanted Pansy and Blaise—so they came back home with us. Two more Adopt-a-Thons and still no takers. By this time it was mid-December and the adoption season was winding down so we decided to keep the girls over the winter. January rolled around, and I said to Warren, "Why don't I take the kittens to the show in Roanoke? It's a small show, not too scary, and maybe we can find someone to adopt them." At this point, the kittens were six months old. Armed with their paperwork and shot records, we made the trip to Roanoke. In the first ring, both kittens were a little hesitant, but got through it okay. In the second ring Pansy started to huddle in the back of the cage, but Blaise discovered she liked showing . . . because the judge had toys! By the third ring, Blaise was exploring the sisal posts of the judging table, happily scratching away and then turning to the audience and staring at them as if to say, "I'm a star!" By the fifth ring, I retired Pansy, as she clearly indicated that she hated the entire process—but Blaise had a blast! Despite the benching cage covered in rosettes, no one stepped forward wanting a pair of kittens. I hoped to place them together, since they were so bonded. I brought them home and they became "failed fosters." They would remain with us forever. Backtracking a bit, I should admit that I had opened my mouth at the CFA Annual in July 2014 regarding promoting the Household Pet, so I figured I had better support the clubs and take a Household Pet out for the new season. I had shown and bred Tonkinese for years, but had retired from breeding. I still enjoyed showing, and Blaise provided me with the opportunity to have a lot of low-key fun. The cat may not be declawed. The cat must be free of fleas and fungus. The cat's nails must be clipped. It is recommended that the cat be up-to-date on its shots. The cat must be spayed or neutered by the time it is eight months old. The HHP class is not restricted to non-pedigreed cats, but pedigreed cats that are shown usually have a disqualifying fault that makes them ineligible to be shown in the pedigreed classes. CFA really has no particular standards for household pets. Most judges award household pets on personal preference, depending on the rapport that they have with the cat. Judges give positive weight to cleanliness and presentation, condition, and the cat being amenable to being handled. While a bath is not compulsory, it is a good idea. The cat that likes to play well on the judging table may also be given additional points by the judge. Household pet needs 200 hundred points to earn the title of Grand Household Pet, or GH. In order for points to count to the title, cats must be registered with CFA. It's easy to register online. Go to http://www.cfa.org/Registration/RecordingAHHP.aspx . Points are awarded the same as regional/national points. You count up the number of household pets present at the show, and subtract 1 for best cat – because you cannot defeat yourself. Second-place gets 95% of that number, third place gets 90% of that number, etc. each ring where your cat makes a final gives the cat points. Show flyers for all CFA cat shows can be found at www.catshows.us. There is usually a link to online entry forms. Each show flyer gives all the pertinent information needed to enter your cat. Once I decided to show Blaise, it dawned on me that she was the first longhaired cat that I've ever groomed. Her bath process takes me a half hour, and blow drying can take up to an hour and a half or longer. It took me a while to get the knack of it, but eventually I had her grooming routine perfected. Because I am a vendor of Sturdi Products at many shows, I don't get a chance to hang out and schmooze at the shows unless people come to the booth to chitchat. Showing Blaise got me out into the show hall where I met a lot of wonderful people, many who became friends. Going to and from the rings with Blaise, I often encountered spectators who were thrilled to see her, pet her and tell me about their cats at home. I continued showing Blaise throughout the season. She consistently charmed the judges and was Region 7's Highest Scoring Household Pet for 2014–2015. History Is Made . . . A CFA First! Beginning May1, 2015, there was a big change debuting in CFA. For the first time in its history, CFA was offering household pets the opportunity to earn an official title. Household pets could now earn Grand points. Once a kitty earned 200 grand points, it would be awarded the title of Grand Household Pet or GH. 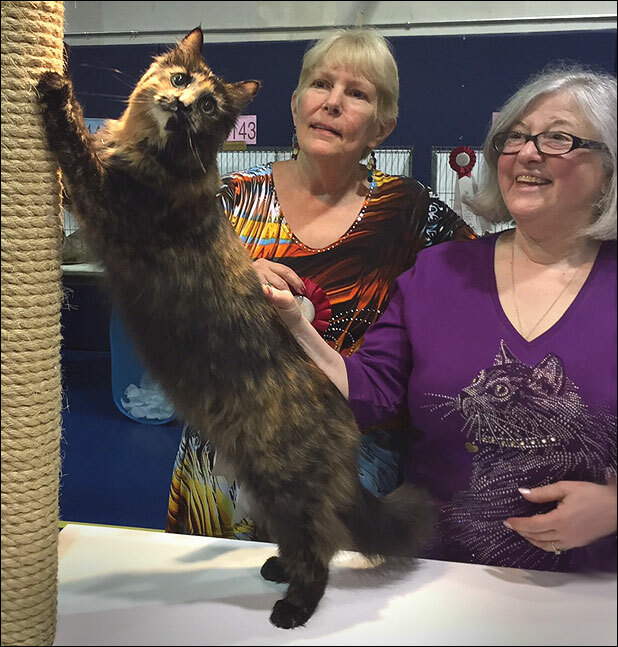 I always attend the Seacoast Cat Club show, and I had been to the Anthony Wayne Cat Fanciers show the year before, so it just seemed natural for me to take Blaise to those two shows to see if she could add the new GH title to her name. First we went to Seacoast and she almost made it—197.5 points. She was 2.5 points short of being a one show Grand! The following weekend at the Anthony Wayne show we knew if Blaise made any placement at all she would earn the new title. Blaise was in Sharon Powell's ring waiting to be finaled. I handed my friend, Robert Hallead, my iPhone and and asked him to take a photo of the ring. As we were sitting at ringside, and Sharon began awarding her rosettes, it became apparent that Blaise was going to be her Best Cat. I turned to Robert and asked, "What time is it?" A minute later, Blaise was on the table and Ms. Powell presented her with the Best Cat rosette. On May 9 at 10:38 AM EST, Blaise became CFA's first Grand Household Pet at the Anthony Wayne Cat Fanciers Show in Ann Arbor, Michigan. GH Blaise always knew she was destined to be a star. 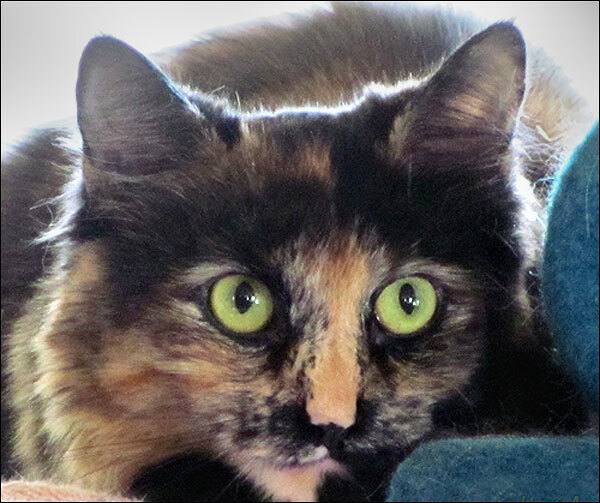 The starving kitten that was a throwaway—discarded in the woods with her sisters—is now a history-maker with her name permanently carved in the record books of CFA. Sue Robbins has owned cats most of her life. She and her husband acquired their first cat in the 1990s—an eight-year-old patched tabby and white they named Ms. Meatloaf. When Sue visited her first cat show in 1998 she absolutely fell in love with the Tonkinese breed. By April 1998, she acquired her first Tonkinese from Roger and Barbara Robb. His name was GP Kenobi Adm Benden. Sue added her Cattery suffix "of Opurra" and she campaigned him to a regional win in the North Atlantic Region. Ben was her best buddy and heart cat until he crossed the Rainbow Bridge in April 14, 2014. Sue bred her first Tonkinese litter in 2000. A few years later she campaigned GC, NW Jack Rance of Spielzeit to CFA's 16th Best Cat in Championship 2003-04. He still sleeps on her bed. Concerned about not wanting to outlive their ability to take care of too many cats, Sue and her husband retired from breeding in 2012. They thought that there would be no more kittens in their home. The field and forest gods decided otherwise. They gave them Pansy and Blaise, and then two months later another stray—Lady Jane—joined the family.